Like the turning of a page from a book of memories. My dreams have told me many things. From its charming yet tragic past. As their sighs become tears. Written in 1913 by the then 19 year-old Juan Parra del Riego (1894-1925) El Puente is from the author's larger Canto de Barranco. Later to be known as "The King of Peruvian Poets" del Riego's work is largely unknown outside of South America with very few translations attempted in English. 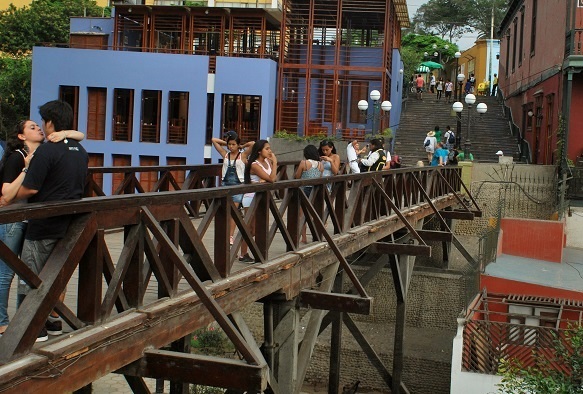 The Bridge of Sighs is an actual bridge in Barranco — an area of Lima, Peru. Inaugurated on Valentine's Day in 1876 the "Puente de los Suspiros" underwent a major renovation in 2008-2009. It reopened to thousands of gatherers on Valentine's Day 2009 and remains a popular destination for lovers young and old to gather and dream. 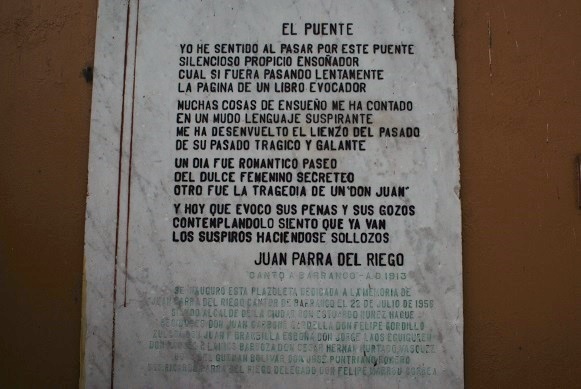 The area under the bridge is known as Juan Parra del Riego Park and his poem El Puente is immortalized on a nearby wall. Otro fue la tragedia de un "Don Juan"